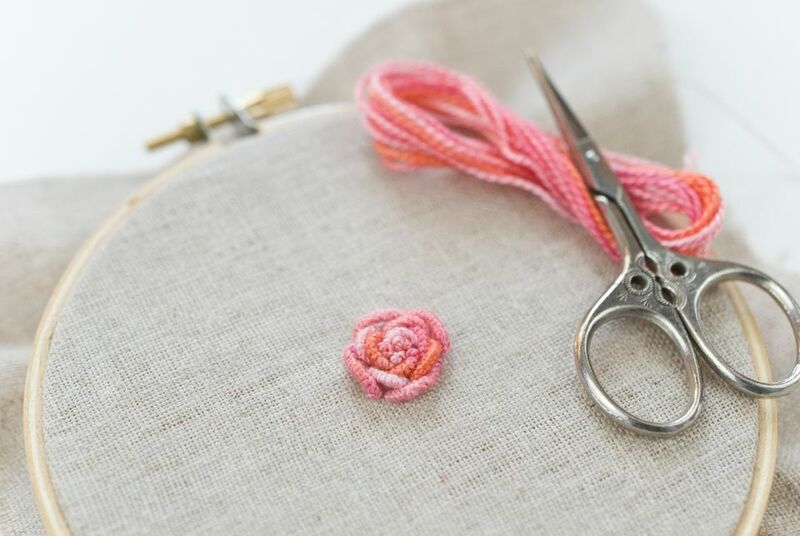 If you love floral embroideries, you need to know how to stitch bullion rose. Although worked with a more advanced stitch, this beautiful flower is quite simple, while giving a strong visual impact. A bullion rose is created with a basic center, and then, you guessed it, bullion knots! If you haven't learned this stitch before, you should practice making bullion knots of various sizes. Be sure to try making curved bullions, where the wrapping is longer than the distance of the stitch. The example for this tutorial uses DMC Color Variations perle cotton, but you can embroider a bullion rose with standard embroidery floss, crewel yarn, silk ribbon or more. With just a bit of preparation, you'll be ready to make this gorgeous flower. Before you make a bullion rose, make sure you know how to make bullion knots. To work a bullion knot, bring the needle up at what will be the top of the knot (point 1). Without pulling the needle all the way through the fabric, go down at the bottom of the knot (point 2) and back up at the top (point 1). Leave the needlepoint poking out through the fabric. Wrap the embroidery floss around the point of the needle. Wrap the needle as many times as it takes to cover approximately the same amount of space on the needle as there is space between points 1 and 2. Make the wrapping solid, but not too tight. Hold the wrapping with your non-dominant hand and slowly pull the needle through the wrapping and fabric. This part can be tricky if the wrap is too tight, but you can twist it slightly to loosen it if necessary. Pull the thread through the wrapped knot until the bullion knot starts to lay down on the fabric. Take the needle back down at the bottom of the knot (point 2). Make sure that the wrapping is smooth and tight, and adjust the way the knot lays if needed. To form a bullion knot with a slight curve, wrap the needle a few more times than usual. The wrapping should be longer than the space between points 1 and 2. To start the rose, embroider the center of the flower. You can stitch a small cluster of french knots, as shown here, or work several small straight stitches close together with similar to satin stitch. Bring the needle up near the center grouping and form a bullion knot that wraps part way around the center. If you're working with perle cotton or similar threads, it's important to pay attention to the twist of the thread when wrapping your bullion knots. If you find that the thread feels like it is untwisting, try wrapping the knots the other way. Continue the rose, adding more "petals" of bullion knots. Rather than having the end of each stitch meet up with the end of the previous stitch, overlap the ends slightly. As the flower grows, your stitches should also grow. Wrap the needle longer, but try giving the stitches more curve as well. You can adjust the look by altering the size and shape of each bullion knot. Because this stitch uses a large amount of thread, if you are working with variegated thread, it's a good idea to pay attention to the placement of the color for each petal. For example, if you see that the next bullion knot will be the same color as a previous petal, don't stitch them right next to each other or start a new length of thread. A bullion rose can be as large as you want it to be. Just keep adding bullion knots around the shape. As you increase the length of the stitches, you may need to change to a longer needle, such as a milliner's needle. If you find that the stitches are lifting from the fabric more than you want, you can tack them down as you would with couching. Combine bullion roses with other florals, such as a woven wheel or even lazy daisies, for a stunning embroidery display. The simplicity of a single rose with a leaf or two is also beautiful. Either way, you're now ready for some very impressive stitching!